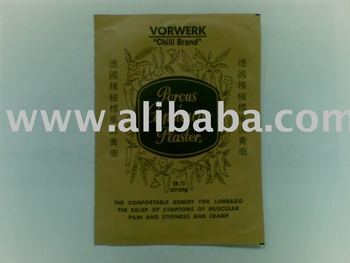 Helps relieve muscle aches, rheumatism, arthritic pains. Chilli Brand plaster delivers quick-permeating, long-lasting and warm action for relief of sore muscles, backaches, strains and pains, general muscular aches, rheumatic and arthritic pain. Formulated with German technology, it is easy to use, painless to remove, and leaves no residue on the skin. Once applied, its unique healing ingredients quickly pass through the keratinous layer, epidermis and dermis. These ingredients then penetrate into the bloodstream through the capillary vessels, providing fast and lasting relief for many hours. Chilli Brand has brought relief to Rheumatism, Lumbago, Sciatica, Chest and Lung complaints since 1955. It is because of our companys strong belief in Quality that has brought us to what we are today. We strive to achieve better results, and we seek like-minded partners to work with us for a win-win relationship.